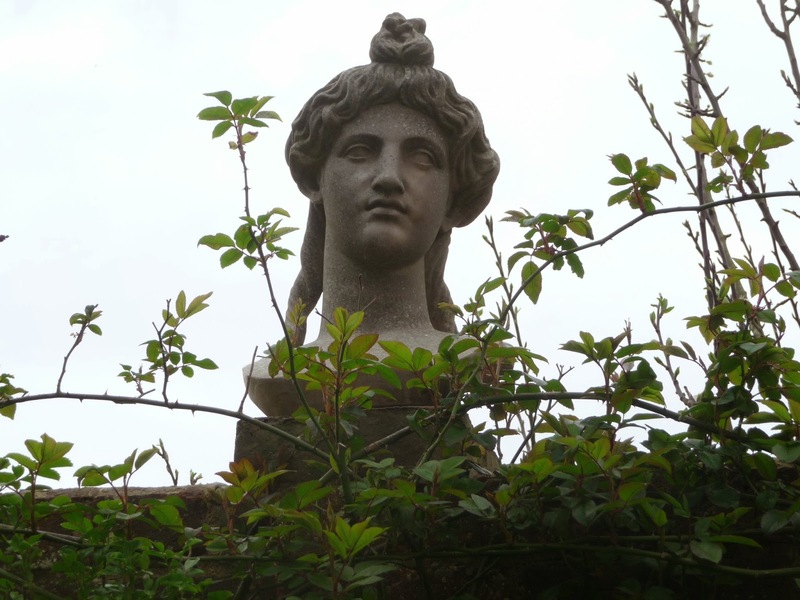 If you wanted to see Dear Husbola's eyes glaze over, just tell him that on one of our England days this spring we were going to take a field trip to Charleston, the summer retreat home and garden of the Bloomsbury group. I have been fascinated by the Bloomsbury collection of writers and artists, philosophers and intellectuals since my early college days. Since my very pinpointed minor in British art, I have gobbled up all things written about this artistic group from the early 20th century that called Virginia Woolf, Vanessa Bell, Duncan Grant, Lytton Strachey, Roger Fry, EM Forster and so many others members. This loose collection of friends and relatives lived, worked or studied together near Bloomsbury London. Their art, writings and teachings really influenced the 20th century and their effects are felt today in ideas about literature, criticism, feminism, economics and sexual mores. 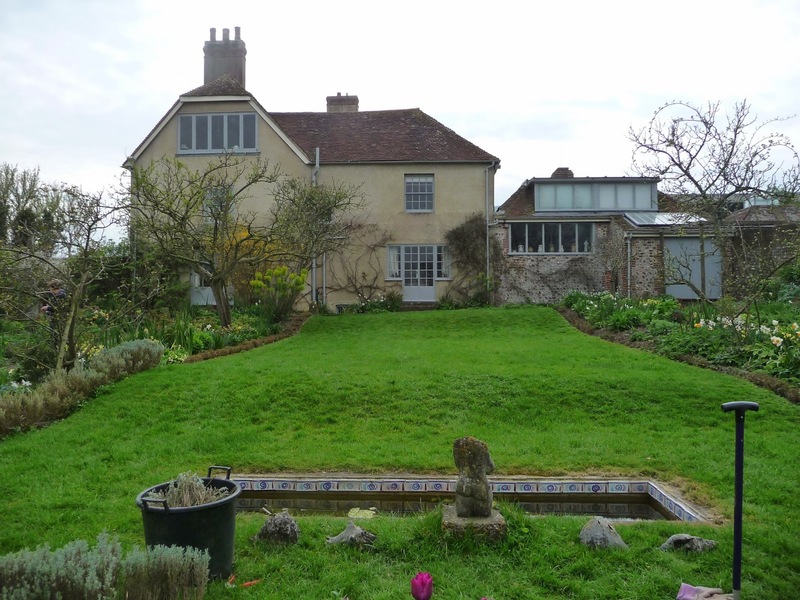 Artist Vanessa Bell and her husband Clive had a country home outside of Lewes England and named it Charleston and we visited earlier this month. It knocked my socks off. A small tour of no more than ten people is guided around the house by knowledgeable docents. 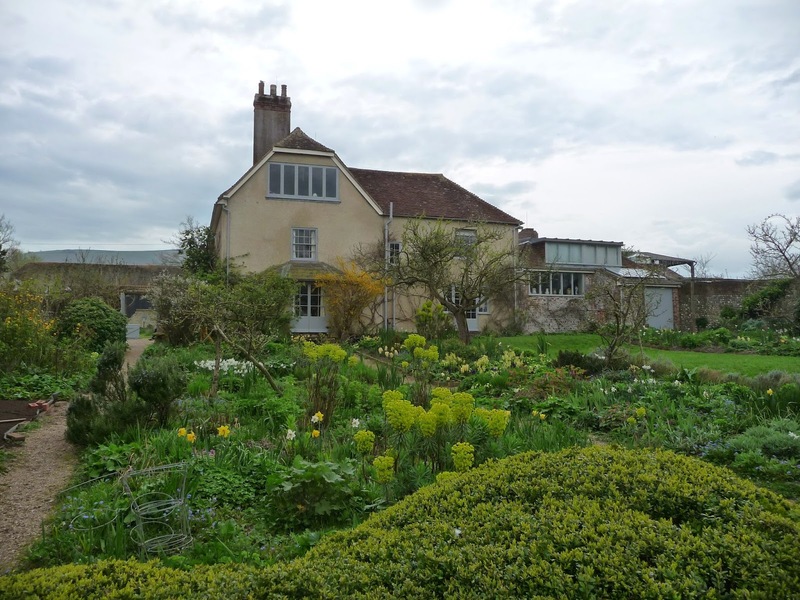 Vanessa Bell and Duncan Grant and Roger Fry covered almost every inch of walls and furniture with the most incredible artwork and painting. 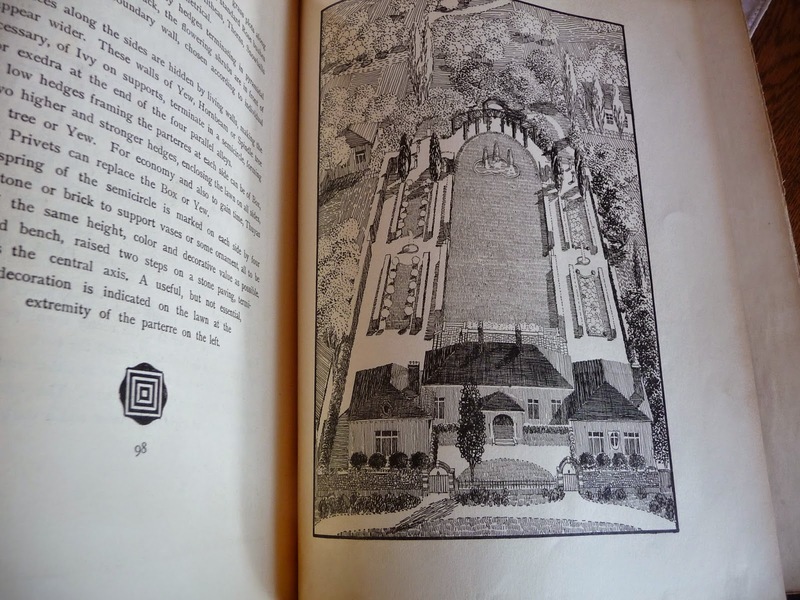 Others in the circle designed fabrics and pottery and the house is a jewel box of their art and life. It is not a museum but a country house that gives the impression that the occupants have just stepped away and you are just a bit early for a country weekend visit. The soap opera of their lives is complicated. Vanessa Bell and Virginia Woolf are sisters. Vanessa marries Clive. But she really loves Duncan Grant. Vanessa has an affair with Roger Fry--but she really does love Duncan. Her husband doesn't much care and they all live together. Virginia Woolf marries Leonard but along comes Vita Sackville-West and she has an affair with her. Vanessa Bell has a daughter named Angelica who thinks Clive Bell is her father--but he's not--Duncan Grant is. Angelica goes on to marry much older David "Bunny" Garnett who was previously a lover to her father........ You get the picture. After the house tour-- a wander through the lovely gardens and a stop at the cafe. 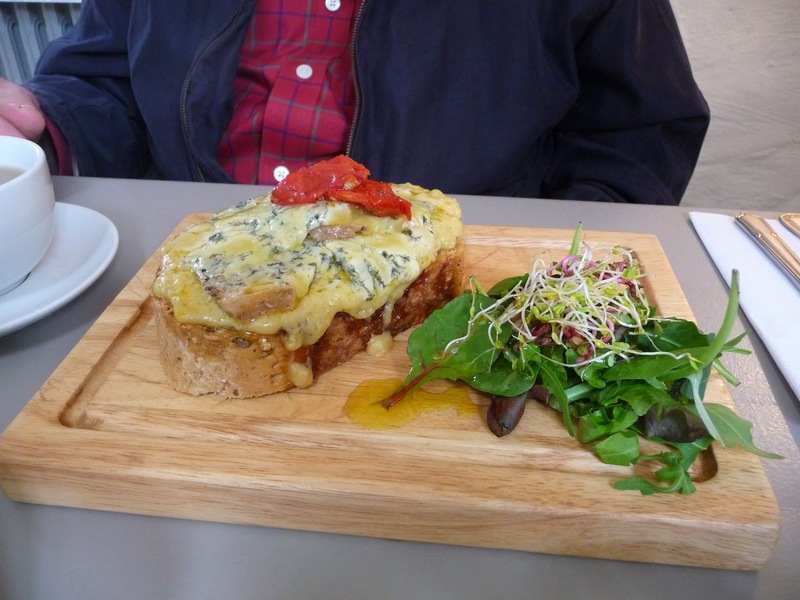 The cafe was a great outbuilding that was very welcoming and had a wide selection of food. 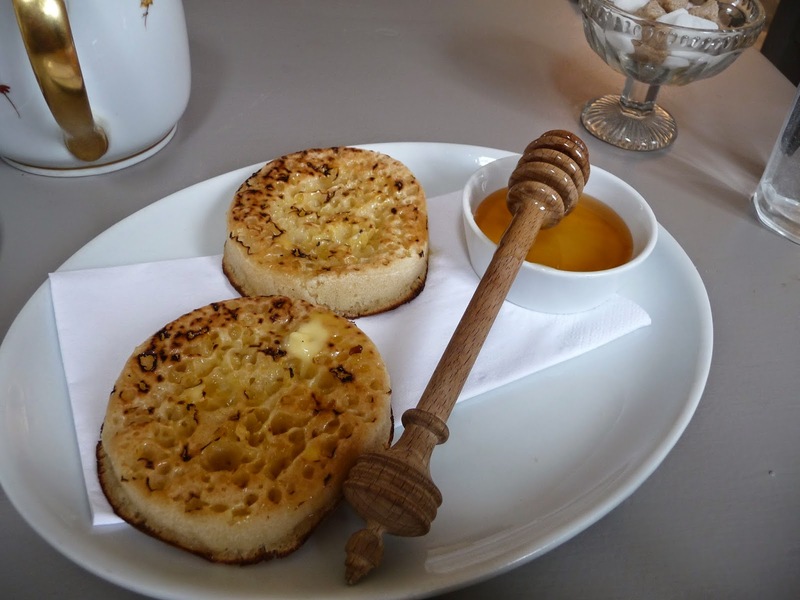 Always about the food, Dear Husbola ordered his favorite welsh rarebit made with stilton and I had a buttered crumpet with english honey. They were very pointed to tell me it was ENGLISH honey. And two cups of earl grey tea please. What is it about red? I love red. Lipstick-shoes-gloves-kitchen widgets and now clocks. 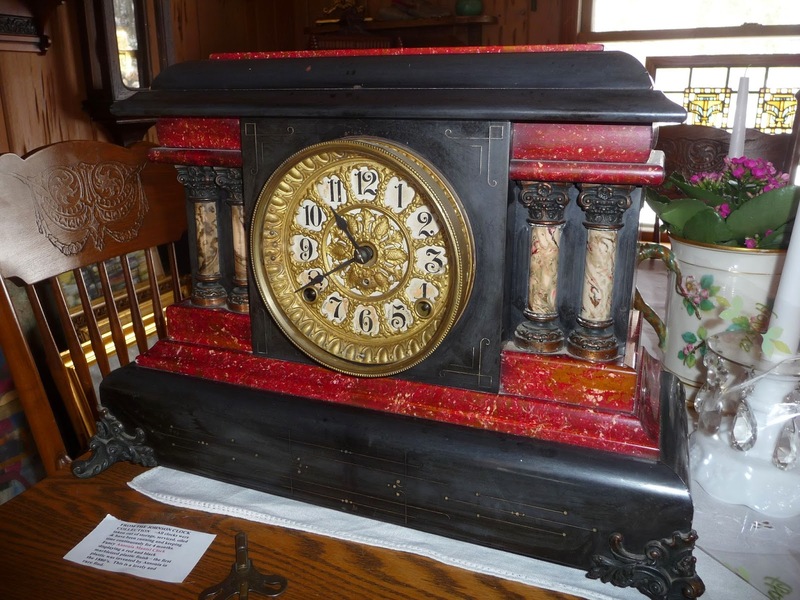 We just found a fabulous Ansonia table top clock. What a looker. 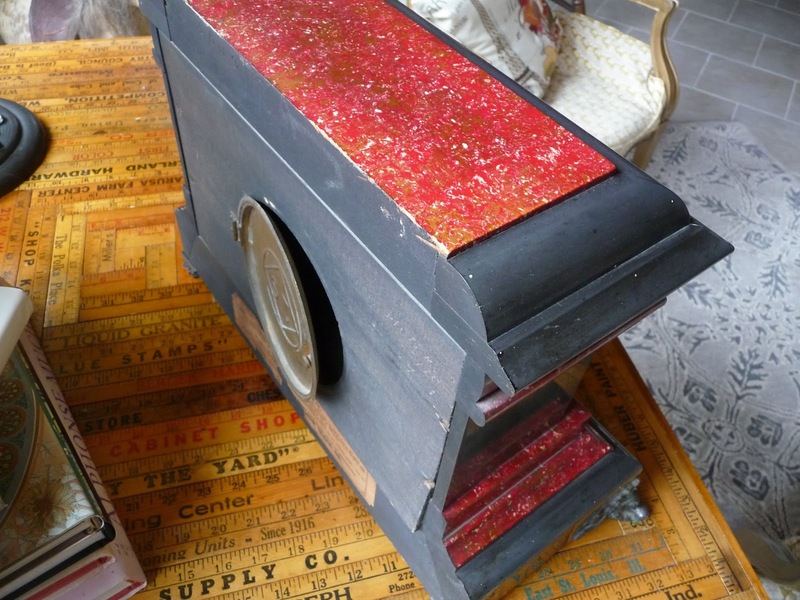 1880s and red faux marble plastic in its earliest incarnation. 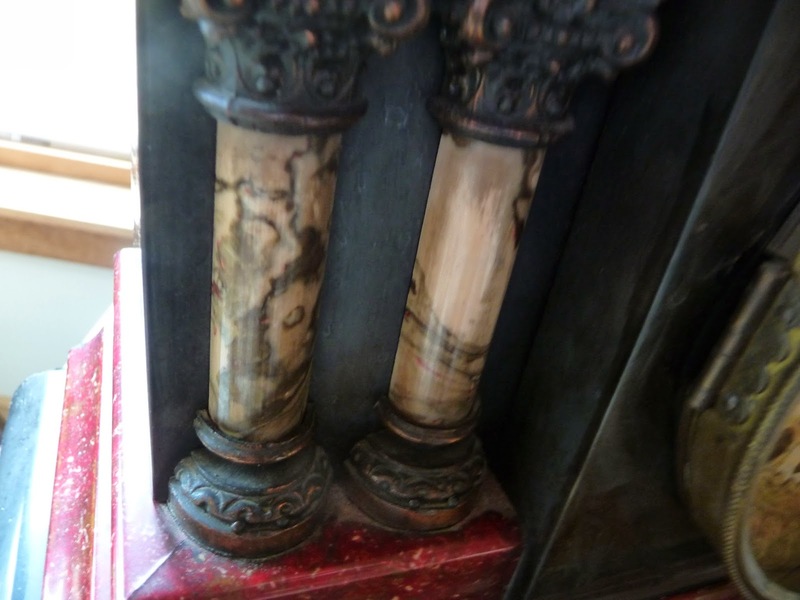 It even has some incredible faux marble columns. It boasts its original label and dial. All good, all working, perfect timekeeper and RED. Dear Husbola and I have just returned from a special trip to the Andalusia region of southern Spain. It was exotic, warm, beautifully scented and much of the food was delish. 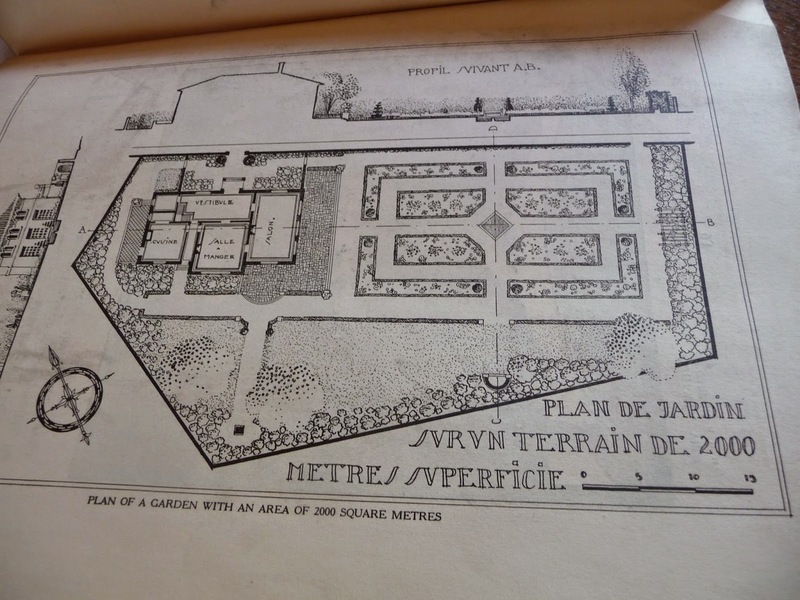 The focus was on the moorish gardens, and a variety of others including Mannerist style, patio gardens and architect designed gardens. The tour director Harriet, who we have traveled with before and has become a friend, asked if she could have shipped to our house an antique book she wanted for the trip--as the cost of sending it to her in Prague where she lives was cost prohibitive. Of course. 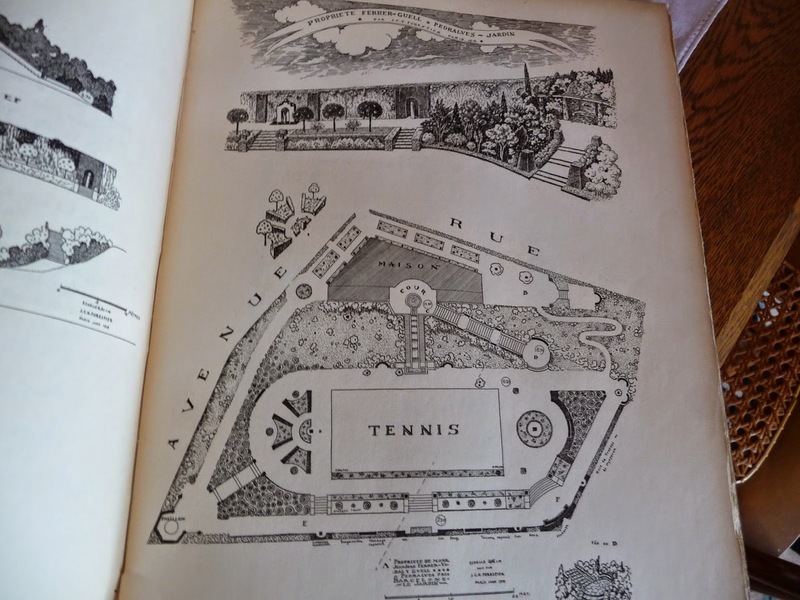 We soon found on our doorstep a vintage book of the gardens designed by the famous frenchman Forestier. 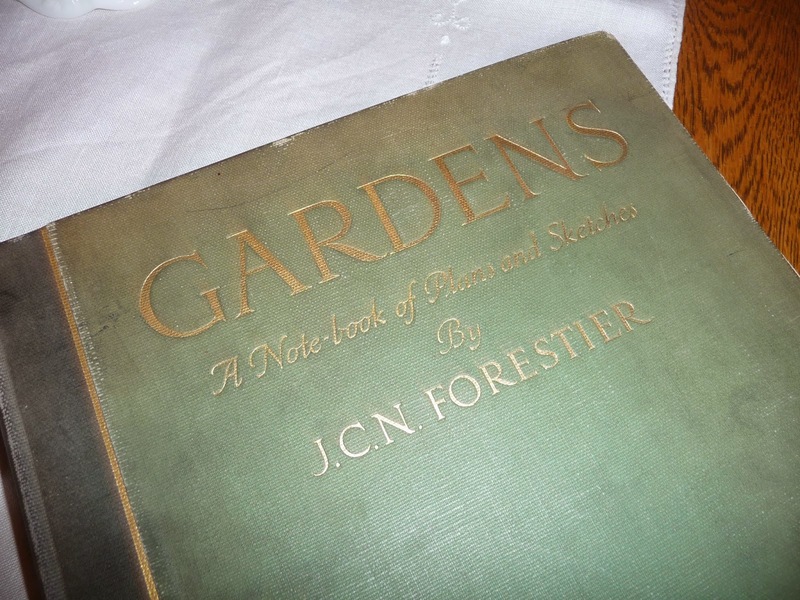 This 1920s treasure was filled with diagrams of JCN Forestier gardens throughout Europe. 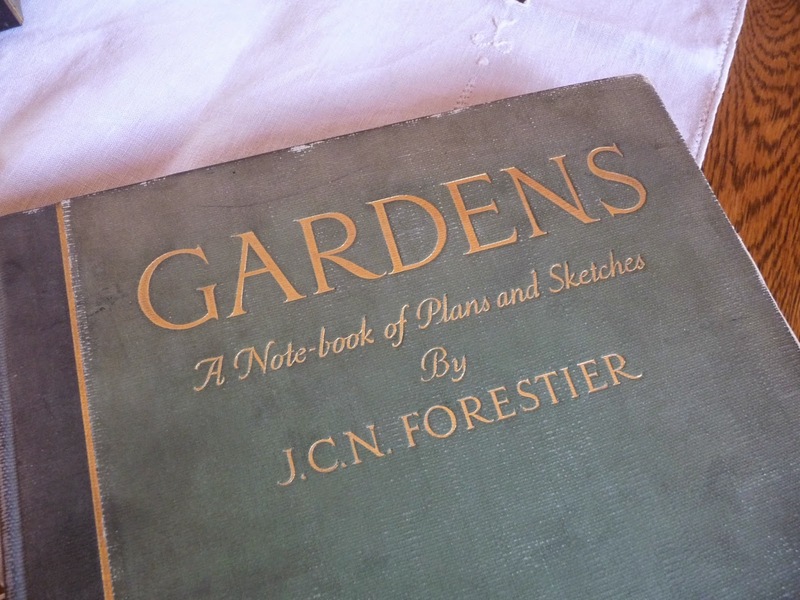 We toured a couple of gardens near Seville and Cordoba that were designed by Forestier. Flowers are not the focus--although there is some color with roses. 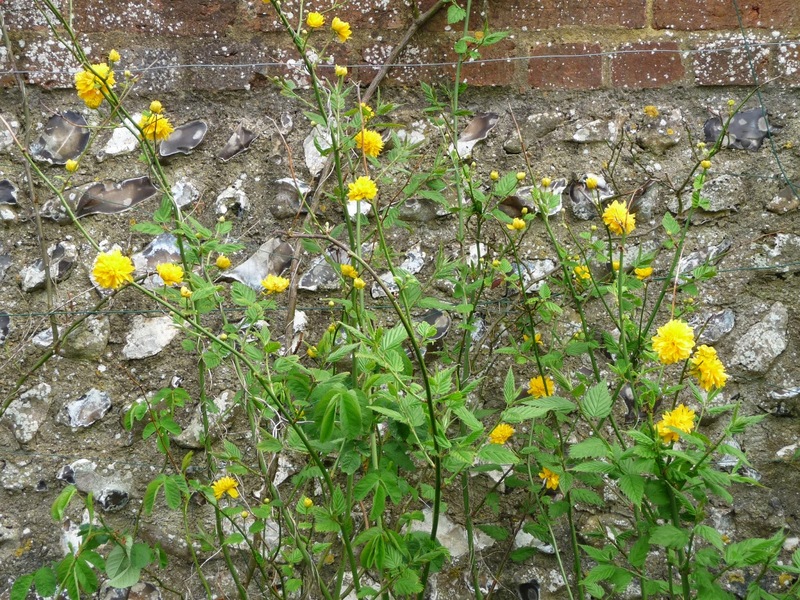 The real focus is on form and structure and texture and varieties of green. We safely packed this book in our luggage and delivered it to Harriet. We referred to it as the Gutenberg in both size and weight. No worries--the void it left was quickly filled with jars of spanish orange marmalade and olive oil for the trip home. I am a bit off of my game. Dear Husbola and I just returned-- and I mean just returned--from a quirky and much needed trip that took us to London, Lewes in Sussex and Many Points in Southern Spain. 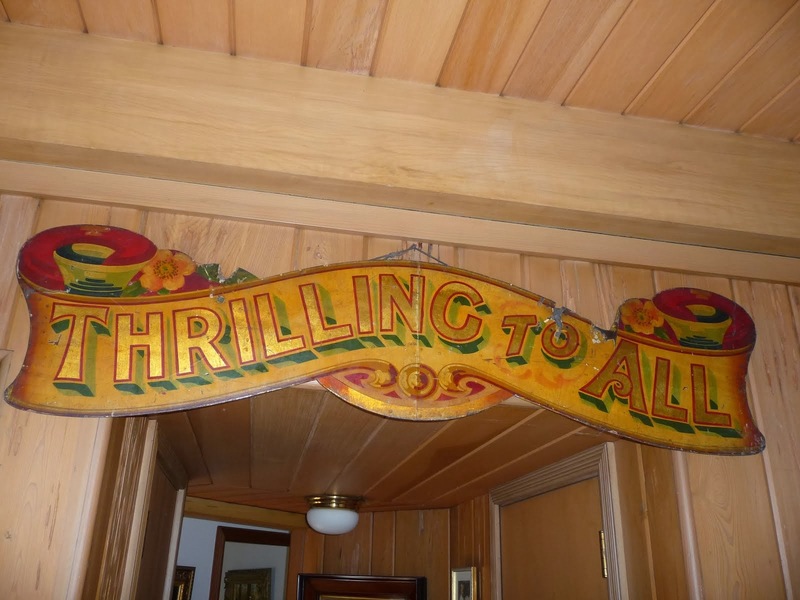 Generally a good trip with many new adventures and delightful if slightly eccentric travel companions. But it did get off to a rocky start. Because we are not traveling to the UK as often as we used to for antiques buying trips, I forget the travel woes that are quite regular in the UK--and especially on Sundays. We traveled on a Sunday. Engineering works aka maintenance and reconstruction are just part of the weekend fabric in the UK on the railway lines. The phrase "replacement bus service" is enough to make a smart traveler change his or her travel dates. Our travels were to take us from Heathrow to London and then out by train to lovely little Lewes. My research showed that the trains were leaving from Victoria station with regularity. So much for research. Our expected tube ride to Victoria Station was not to be. The tube from Heathrow was to have a "replacement bus service" for part of the journey and not running regularly.. So--jet lagged and Becoming Increasingly Cranky--our journey from home to Lewes involved Way Too Many pieces of transportation. Limo to airport--tram to departure gate--airplane flight over--Heathrow Express to Paddington--Taxi to Victoria -- Train to Three Bridges--Replacement bus service to Hayward's Heath--train to Lewes--Taxi to B and B Hotel. Only a Crazy Anglophile would go through this. And a man \who is married to one. 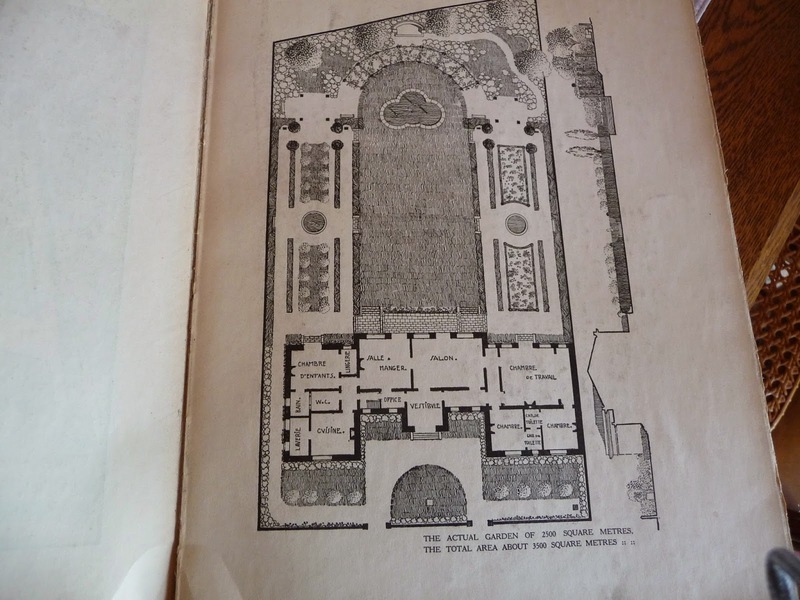 April is a special month when gardens and antique sales wake up after a long winter. If you poke around shops and shows, you can sometimes find month specific collectibles. 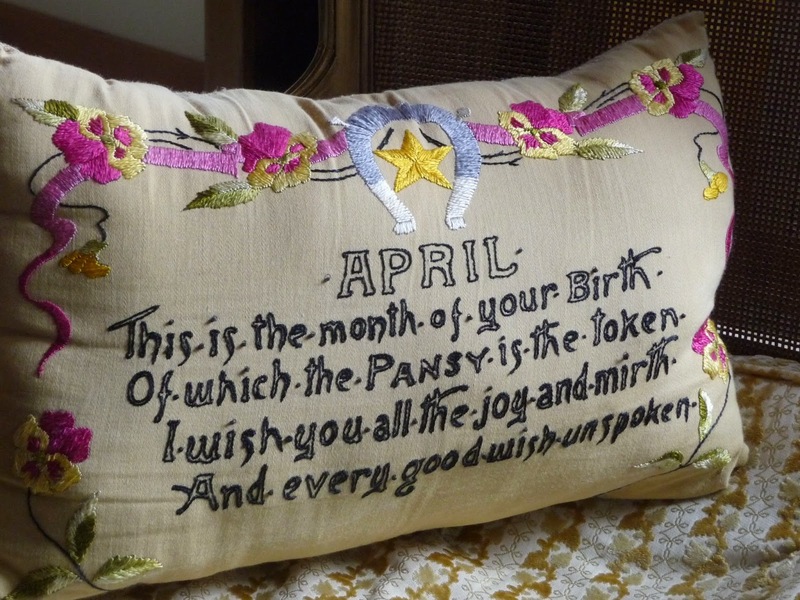 I recently found a fabulous embroidered April pillow--one of a series of "month pillows" that were famous in the early 20th Century. 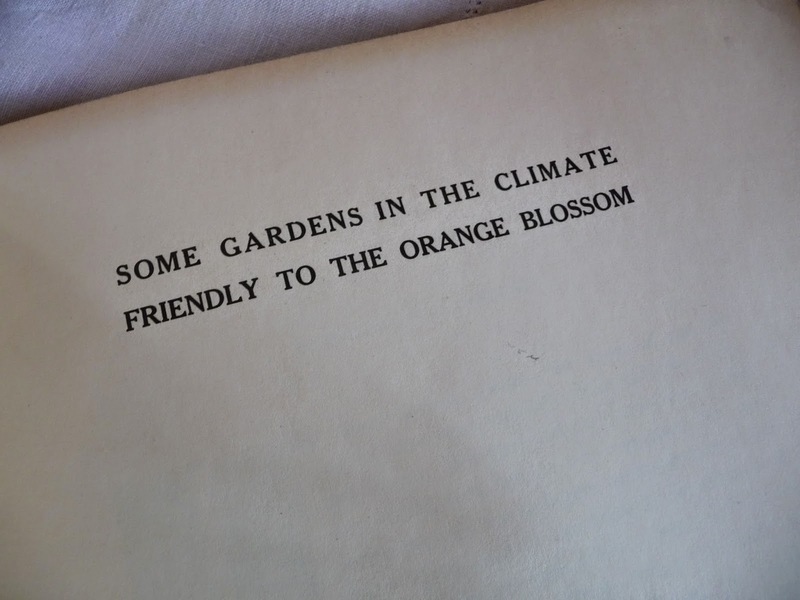 They always featured the flower of the month and little ditty about that flower in a quirky poem. Dear Husbola encouraged me to buy it as a birthday present--for me--an April baby. Probably just what we did not need--another cushion. This early 1900s example is in perfect condition with no stains or rips or problems. The seamstress was skilled and the colors are nice and strong. I have it sitting on one of two matching chairs that are recent mid century addition. I thought I was going to sell these chairs, but not just yet. They are a golden finish and the curved back is perfect condition woven caning. The original upholstery is clean and in lovely shape. I bought these from a dealer who has a fabulous eye--and I thought the price was a typo. The dealer picked them up at a Goodwill store. Never underestimate a Goodwill store. Quirky. 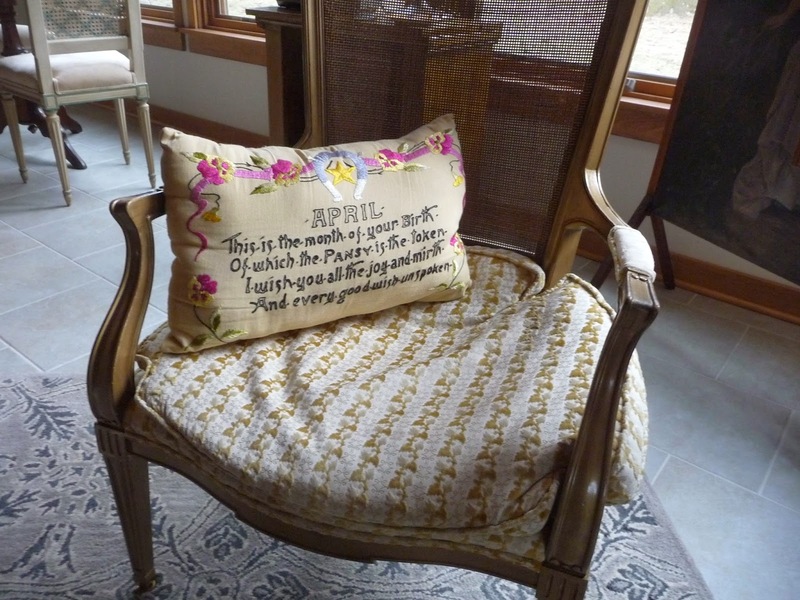 1940s chair married to a 1900 pillow. That is the state of the antiques business these days. Thank heavens. and I should be out in the garage rooting around and getting spring inventory ready. Nope--not yet this year. Still chilly and I am a weenie and and it is impossible to stand in a cold garage and have any fun getting shop and show inventory ready just yet. But I can look at paintings. We are buying and selling quite a few these days. The top photo is nasturtiums--I just love their floppy intense color. Nasturtiums just hang around and say "I know I am pretty and I don't have to work at it.". 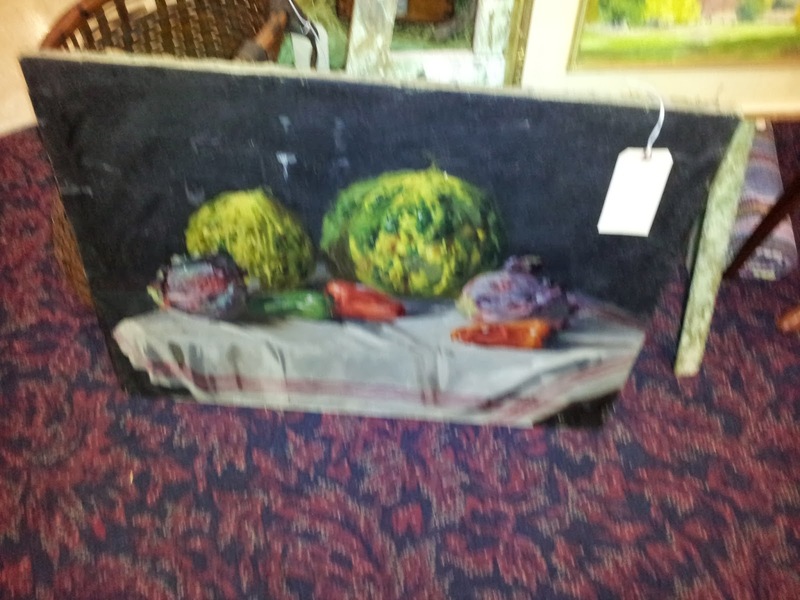 The lower painting is a real popper with several purple and green cabbages. This would be just super for a kitchen or dining room. 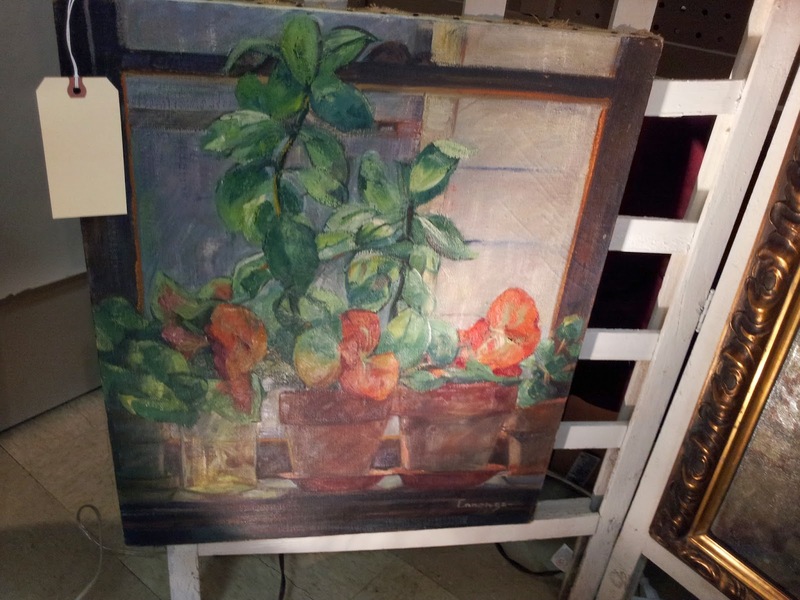 We sell plenty of reasonably priced, casual paintings often by untrained amateur artists. Artwork in your home needs to make you smile when you look at--it does not have to be expensive.